We have use cases where we perform orchestration, where a proxy in its flow invokes other services. The services are invoked trough callouts. Would it be a good design practice to use callouts ? Sorry, didnt notice your comment earlier. Using Route is the best solution to leverage async response handling in OSB when dealing with single end service. 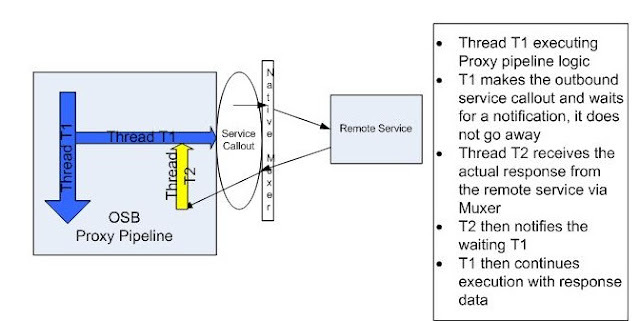 But if you have to orchestrate stateless services, then service callouts can be used but be wary of using it under heavy loads due to the threading issues detailed in the blog. Under normal loads when there is no too many requests using up threads, things should be fine. But under heavy loads, you would require more threads to handle the service callout response as mentioned - one way would to verify that would be to capture and analyze thread dumps of the server under load and see if threads are stacking up waiting for response as described in the posting. But what do your understand by a heavy load? If there are few concurrent requests (well under hundred), then those requests should get handled by available threads soon. But if there are much more requests piling up compared to available threads (like 100s of requests and not comparable number of threads) and the calls use service callouts, this can create thread starvation as each such service callout requires 2 threads as descrribed in the post. Nice article. It really gave the insight of the internal thread model of the OSB and WLS. What are the best practices if you want to invoke a logging service , should we be using the publish action or the route action. For one-way invocations like logging (no response back), using Publish action is best rather than route or service callouts. Sabha, this applied to alsb 2.6.1? Loved the way you have shared your views thanks alot for sharing will surely bookmarked this wonderful resource! Thanks a lot.. Many confusions got resolved. Valuable information.